Countries that are popularly visited by tourists all over the world usually have at least one well known luxurious resort or tour destination that they can be proud with. The deluxe Atlantis, the Palm, Resort and the exclusive Palm Island are honored with the distinction of being Dubai’s pride for luxury accommodations. Almost every aspect of it exudes with class and style starting with the lavish attractions and amenities up to the excellent service that they provide. Majority of the visitors share the same awestruck experience that they got when they first saw the natural beauty and the sophisticated leisure facilities in the resort. Atlantis Dubai is one of the best marine themed resorts in the world. Several water attractions can already be found right inside the resort. Tourists in the country should not miss the experience of world class water park facilities like the Atlantis Dive Center, Dolphin Bay and Ambassador Lagoon. Each of the uniquely designed water and marine park facilites has a different adventure to offer. There are endless leisure activities that you can enjoy in your Atlantis Dubai holiday. You can watch, play and swim with the friendly and playful dolphins of Dolphin Bay. The fans of Atlantis will enjoy a trip to the Lost Chambers Aquarium where they can experience the underwater mysteries of the old Atlantis. The Aquaventure facilities is perfect for the whole family who loves the trills of the water. Really cool experiences await the kids in the water slides and river slides that they can enjoy and have the time of their life with. The Aquaventure beach area is just nearby for a more quiet way to enjoy the water and the scenic view of the island. Arrangements for diving expeditions and boat trips for the whole family may be arranged in a jiffy. 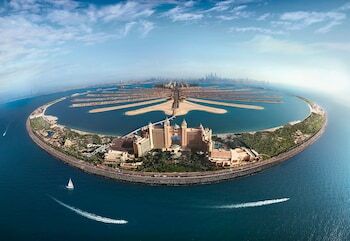 The marine and water park facilities alone can make your Atlantis Dubai holiday great. You may be surprised when you are left with vivid memories of the plush comforts of the rooms. You can choose from their four luxuriously furnished accommodations that include guest rooms, suites, super suites and imperial club. Other world class facilities in the resort include Spas and fine dining restaurants which adds more to the prestige of the experience. The price rates for this holiday match the excellent service and facilities of the resort. The average tourist need to work, save and plan so they can also experience the awesome luxury of the resort.